The scanner is designed to comfortably position the patient so their eye is looking through the center of the EyeSeal Disposable while keeping their head still. EyeSeal Disposables are used to prevent cross contamination between patients. The radius is set to 18mm and the scan area is set to image the entire eye using four equally spaced meridians. This option generates a full set of scans with auto-centering used on the first meridian. It is the default scan type of the device and centers the image on the corneal apex. The device will scan the patient’s eye and then calculate the position of the corneal apex before obtaining the images. As a variation this mode can be set to auto center before every meridian. In this case the device will recalculate the position of the corneal apex prior to each meridian. In some patients auto-centration may not be desirable, therefore the system offers two types of alternative scanning without auto-centration: a no-centering mode and a manual centration mode. Using the manual centration mode enables users to select the desired centration point, e.g. based on certain anatomic variations or due to the fact that the patient is unable to hold the eye steady. The machine will then perform the scans using the selected reference point. In order to benefit from auto-centration but still retain the ability to manually make fine adjustments, the ArcScan Insight System features a continuous scan mode. This enables the user to precisely image a particular, small feature of the eye, such as a scar or implant haptic or a specific region around the zonules. This mode is specifically designed for patients who have trouble holding their eye steady during the scanning procedure. Images are taken individually and the system will prompt the user after each scan to either repeat the scan or continue with the image acquisition. The ArcScan Insight® 100 software was designed to enable users to quickly and easily obtain stunning images, conduct measurements and store them. The ArcScan Insight® 100 software enables users to view, manipulate, annotate and measure the produced scans. In viewing mode, users can adjust brightness and contrast, zoom in and out and conduct a black and white point adjustment. In the analysis section the software offers a range of editing tools, such as snap/unsnap, a magic wand and an erase function. Also, the variety of surface selection options allow for automatic identification of the front surface, epithelium, flap or back surface of the cornea. An added a-scan viewing function displays the a-scan measurement value wherever the mouse is hovering. In display mode, the user can select from a range of different viewing modes, has the ability to conduct measurements of distances, radius of curvature or angles and display thickness maps for epithelium, stroma, cornea, flap, residual stroma and the stroma component of a flap. Naturally, everything can be saved or printed. In this mode, the scan images obtained from the anterior segment can be viewed, annotated and measured. For measuring, users can choose between distance measurements, radius of curvature and angle measurements. 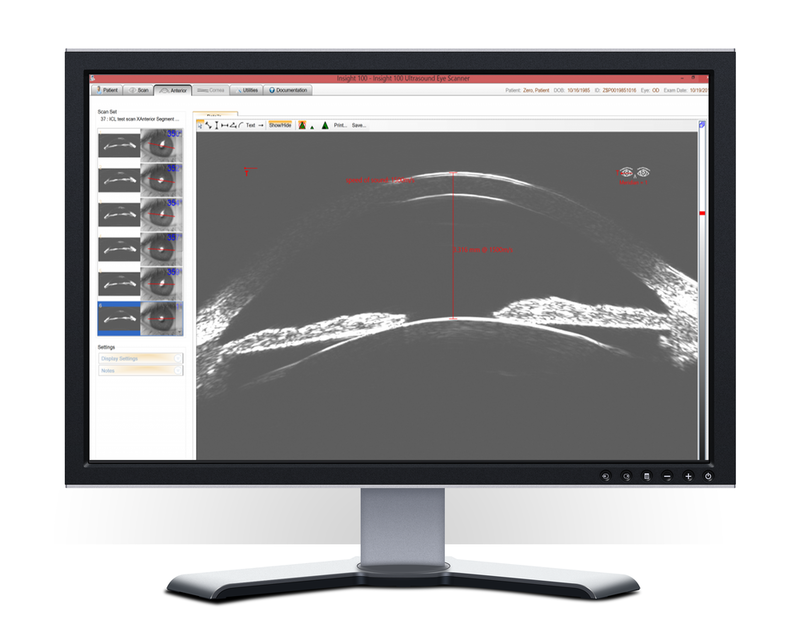 The ArcScan Insight System is indicated for evaluation and/or planning of refractive surgery and evaluation of pathologies of the anterior segment such as trauma, tumors, cysts, glaucoma, and hypotony. Scanning should not be attempted on un-repaired ruptured globes or in other situations where ocular integrity is questionable.